Today I’m going to give you an updated review of the Best Robot Vacuum for Pet Hair 2018 to see if anything is changed from last year with new releases of robot vacuum cleaners. We all love our pets and can’t imagine life without them, but it doesn’t take away from the fact that they can create a bit of mess and a lot of cleaning if they shed their fur. When you take on a pet you accept the responsibility of doing everything required to keep them healthy and happy but you also need to make it as easy for yourself as possible. This is where a robot vacuum can come into it’s own as you can easily deal with pet hair on a daily basis with a robot vacuum without much effort on your part. Last year I chose the Neato Botvac D5 Connected but they have brought out the new Neato Robotics D7 Connected and I just had to go for this one because it has all you need and more. is a D shaped robot vacuum with laser mapping so that it can work out your room shape, obstacles within it and create the most efficient route to clean. Why I like it so much for pet owners it the fact that it has a turbo mode which can work well on carpets and hard floors. It has a spiral combo brush and a side brush so it can easily pick up pet hair and a good size dustbin too. can pick up particles as small as 0.3 microns which is as good as a HEPA filter and covers most allergens which is better than the Roomba. One of the other important things to consider when buying a robot vacuum is being able to schedule regular cleaning either daily or every couple of days to keep the pet hair at a minimum. You can even set this vacuum up to work with Alexa if you like to have voice control. The Roomba 980 took second spot for me last year and I still feel the same this year. It’s a top rated robot vacuum and I’ve only marked it down because the filter is less good at picking up allergen particles than the D7 with a level of 1 micron. I still think it’s the best Roomba for pet hair though. is fantastic at picking up pet hair though and with a double rubber brush system underneath, side brush and boost control it can handle itself well in the cleaning area whether you have carpets or hardwood floors. You can also choose whether you want the vacuum to do 1 pass or 2 when cleaning so if you feel that your room is in need of an extra clean you can set that up on the app, perfect for if you have more than 1 pet that sheds hair. This also has a camera mapping function so that you get an efficient cleaning path. You have a full scheduling option so that you can clean on a daily basis if you require it and any combination in between. You can also set it up with Alexa and just clean when you tell it to. With notifications and the ability to keep track of what your robot vacuum has done it offers you plenty of cleaning power and control to keep your floors in check. has been upgraded with wifi control via an app and it can work with Alexa. as this robot vacuum cleans in a more random mode and doesn’t have as long running time. This will still give you a good clean though. You also have the option to schedule the vacuum to clean on a daily basis or days that suit you and it’s all easily set up using the app where with the 650 you have to use the buttons on the top of the unit. You don’t get as many features as the top rated robot vacuums but it’s functional and can handle all floor types. I’ve decided to bring in the Shark Ion Robot 750 instead of the Roomba 770 because it is a very functional and cheaper alternative to the Roomba vacuums. Although Shark are newer to the robot vacuum game they are a leader in the standard vacuum cleaners so they know their stuff. This is a circular type of robot vacuum with a self cleaning brush underneath making it quite capable of dealing with pet hair on carpets or hard flooring. It has 2 side brushes to get into edges and good suction to deal with anything it picks up. It has smart sensors to stop it bumping into things but it cleans in a random fashion like most of the cheaper robot vacuums. It cleans well but not as efficiently as if it had room mapping. also works with Alexa so you can ask it to clean at any time. There’s not a lot to choose between the Shark Ion Robot 750 vs iRobot Roomba 690 so it really depends on your own preference and if you want a Roomba alternative. 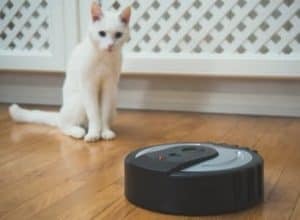 The Neato Botvac D80 is the perfect robot vacuum for pet hair for you if you don’t like wifi and app controlled products. Don’t think that because it isn’t controlled by an app that it doesn’t have many features because it has laser mapping which means it can clean the room efficiently and return to where it stops if it runs out of charge. Neato robot vacuums have large dust bins and HEPA style filters making them suitable if you have pet allergies and it helps keep the air clear as well as the floor clean. The D80 has a rotary brush and a blade brush so you can use what works best on your floors with good suction to give good pet hair pick up. is reasonably priced and well worth considering if you have a pet or an allergy. can help to keep the air cleaner. If you’re looking for the Best Robot Vacuum for Pet Hair 2018 then check it out at Amazon.com.